This chapter investigates those reality television programmes where an environmental theme is foregrounded. It initially discusses the main features of reality television: its representational claims and its production of affect and social integration through the public presentation of what are often more private practices and modes of being. 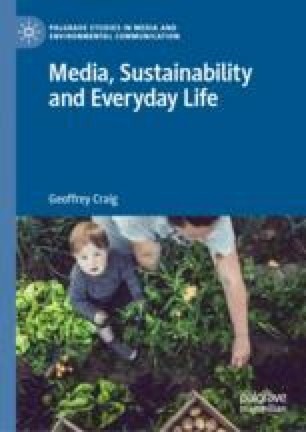 The chapter discusses the roles of the programme hosts and the ordinary participants of reality television shows. An analysis of the eco-build episodes of the popular Grand Designs programme demonstrates that such episodes work to normalise and pluralise sustainable building and lifestyles. A case study of the Aotearoa New Zealand reality television programme, WA$TED! reveals how the show highlights and traces the environmental networks that inform and animate everyday practices and objects. Houston, Melinda. 2012. “House Proud.” The Sydney Morning Herald, September 3. https://www.smh.com.au/entertainment/tv-and-radio/house-proud-20120831-253yg.html. Ministry for the Environment. 2007. “Talk Sustainability.” Issue 4. http://www.mfe.govt.nz/publications/sus-dev/talk-sustainability.